cLICK HERE to see our Monday programme (16th April version). 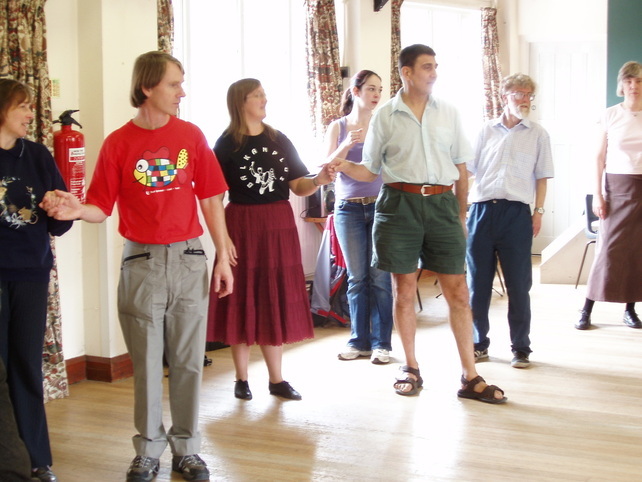 SAMPLE WHAT WE DO - open strings, varied dancing, handbells, walking & more. This is what took place in April 2014. So cLICK to see what our day & evening programmes are like. To book a discounted Monday daytime or/and meal: click on our "Early Days" page. Do COME to share in a wonderful, special day. With Catering just enjoy all this with no need to prepare sandwiches, or to cook at home. Monday 28th April 2014 PLAN IT - AND LOOK AHEAD NOW - Take a break. Why this working day in April? We've chat time over lunch too. 4) Bluebells open for our event. A lovely sight and scent. Partake on Monday 28th April; Altogether a Spring experience not to miss.